This adventure will take you to two entirely different Austrian cities. Begin with three nights in its capital: Vienna. Dive headfirst into a world of Central European, imperial grandeur complete with cozy wine taverns, one of Europe’s greatest treasuries, Habsburg palaces and traditional Viennese pastries. 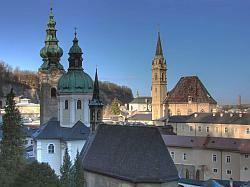 Then travel to Salzburg, a riverside beauty located a stone’s throw from the Alps along Austria’s border with Bavaria. Three nights there will show you why its Baroque architecture, Alpine scenery and classical music scene are so legendary.